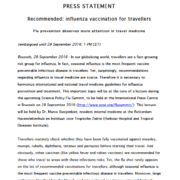 ESWI has issued a press release to highlight the fact that flu prevention deserves more attention in travel medicine. This press statement is released at the occasion of Dr. Marco Goeijenbier’s lecture at the Science Policy Flu Summit, to be held at the International Press Centre in Brussels on 28 September 2016. Download the press release here.